I love a juicy succulent bite of organic gluten and dairy free chicken. For me it’s even better if it bites back. 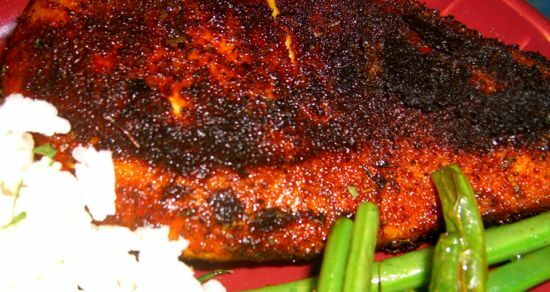 If you’re ready to kick it up a notch why not take that wonderful plain organic chicken breast and make it Blackened Chicken! If it’s cold where you live, this will help heat up the night. This is a quick meal to make especially if you make your seasoning mix and keep it around for the next time you want to add a little extra spice. I love to add this mix to chicken, fish, shrimp, pork or beef. To make this Vegetarian and Vegan you’ll love the Blackened Seasoning Mix on sweet potatoes, grilled vegetables, polenta, stuffed mushrooms or just about anything you fancy. This is also a great mix to tuck into your notes to make and give away as gifts with your favorite ways to use it. People love to get gifts they can eat or make their life easier and this will do both. Have fun with the mix and let me know what creative ways you use this besides chicken. Heat your pan on medium high and let the oil get hot. Pour out some of the spice mix onto a plate. Take your chicken and press it into the spices on all sides. When the oil is hot and you will know because it will start to ripple, carefully add the chicken to the pan. I always use my splatter screen when cooking this but don’t think it will keep the stove clean, it won’t. When the top of the chicken starts to change from a raw look to slightly cooked in color, turn it over. Don’t be alarmed when you do and your chicken is black, it’s supposed to be. Remember this is blackened chicken. The second side will take less time to cook. After 3-5 minutes, I check by pressing down on the chicken. Raw chicken and cooked chicken will have a different feel. When it feels done, more firm when pressed, I take it out and cut into the middle. If it is no longer pink and the juices run clear, it’s done. I served this with rice cooked with a bay leaf and toasted onion and fresh thin green beans with shallots. If you like your meals spicy hot, the rice is a good side dish to help put out that fire on your lips. ← Do You Touch Your Food Or Just Fork It? Yes! White Pepper is one of my favorite seasonings! I tend to eat super spicy foods in the winter, too. I bet this would be killer on a nice piece of fresh Grouper, too! Katrina I'm not sure what it is about white pepper, but it can really give a meal depth in taste. Grouper sounds wonderful. I'll be over for dinner. Shirley great idea to use it with your bean burgers. YUM! Love me some blackened seasoning! This sounds delicious. This is exactly the seasoning blend I've been looking for! All others weren't quite right, but I can tell this one is it. Thanks Diane!